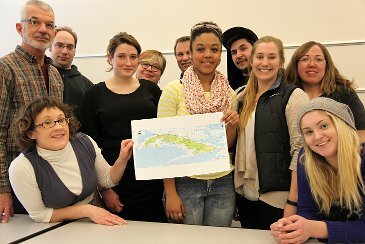 A contingent of NMC students, faculty and staff who depart for Cuba Friday are the leading edge of a new distinction for the college: more study abroad students and destinations than any other Michigan community college. The Cuba experience is among seven planned study abroad experiences this year. About 80 students from a dozen programs will travel to six different countries, including Cuba, South Africa (also during spring break), Brazil (two trips), Italy, Russia and Costa Rica. According to a survey by NMC’s International Services & Service Learning office, that’s more than any other community college in the state. Jim Bensley directs that office and also teaches a World Cultures class. He chose Cuba as a destination before President Obama announced a plan to thaw relations with the Communist nation last December. With greater economic development imminent, experiences on the island isolated for half a century becomes even more valuable now. “It's rare U.S. residents ever get the chance to visit Cuba,” he said. “With Cuba so inextricably linked to the past, there is a genuine uniqueness that won't always be as apparent as it is today." Visual communications student Desiree Morgan is looking forward to that culture shock. She’s never traveled further than Canada, but had an interest in studying abroad. VisComm students are planning to film a documentary during the trip, which counts as academic credit. Michael Meteer initially signed up by accident, selecting a course code that included the Cuba experience instead of one that did not. But the psychology student is happy with how things turned out. “I’m most looking forward to the stories I’m going to come back with,” he said. An increased emphasis on study abroad is part of the college’s strategic direction to ensure that NMC learners are prepared for success in a global society and economy. Next year, Bensley is planning eight student study abroad trips to several new destinations, including Guatemala, Ecuador, Greece and possibly Ethiopia. For more information visit nmc.edu/study-abroad.